Peace. Quiet. Privacy. Calm. These are oft-promised qualities in luxury hotels, pervading the marketing material of high-end resorts in all corners of the globe. They are seldom delivered. But what’s the point of selling a New York hotel, for example, as some kind of monastic, silent retreat? Regardless of the efforts made by attentive staff, as soon as one window slides open, that raging, energetic metropolis climbs through until you can breathe the bustle, and besides, isn’t that the point of going to New York? In towns, cities and resorts all over the world I’ve been promised serenity only to discover that this only really amounts to a TV above the bath and an ever-so-subtle doorbell when the turndown folk visit, barely audible over the roar of the air con. Aman Sveti Stefan is different. As one of the iconic images of Montenegro, and a renowned retreat for the rich and famous for decades, its story is well-known: what began as a fortress village to defend against the Turks became a settlement of around 400 people, before becoming unoccupied and being turned into a luxury hotel during the Tito regime. Hollywood’s elite took solace in its sheltered footpaths, with Liz Taylor, Kirk Douglas and Orson Welles all visiting. The place is perhaps uniquely paparazzi-proof, as only hotel guests can cross the tiny causeway leading to the islet, and no level of photographic skill could enable an impossible long-lens poolside shot from a boat down below. (That might be one of many reasons the recent Wimbledon champion, Novak Djokovic, decided to tie the knot here earlier this year). 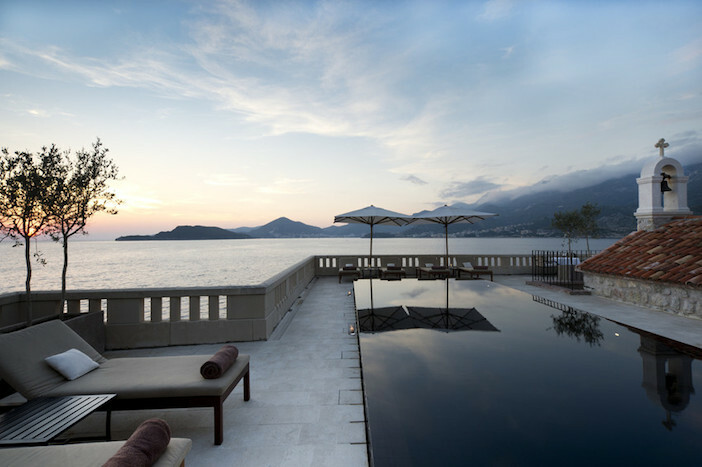 The separation of Montenegro from Yugoslavia precipitated a decline in the resort until Aman Resorts stepped in, in 2007, halving the number of rooms to just 50 and restoring Sveti Stefan to its former glory. And what glory. We spot Sveti Stefan from the plane into Tivat, a delightfully tiny airport perched scenically on the edge of Boka Bay. From the plane it looked like a rocky teardrop dangling from the Montenegrin mainland, and 40 minutes after stepping off the plane we’re winding down past party-mad Budva and into the leafy compound that Aman has made its own. Its staff man the entrance to the footpath, directing the general public to their beach to the left of the resort, and hotel guests to their private beach to the right. I find it difficult to suppress a child-like grin as we’re beckoned onto the immaculate white path leading to the resort. It feels unconscionably elite, just deliciously exclusive. We leave our bags with willing staff and, unencumbered, pick our way across to our private islet. The administrative elements at reception seem almost non-existent as the resort wisely decides to introduce itself through a walking tour, stopping by its various breathtaking, implausibly beautiful vistas. At the piazza, where breakfast is taken, the better tables sit on outcrops that begin to cascade down the cliffside, displaying unspoiled shimmering blues as far as the eye can see. The clifftop pool for shade-seekers, when it gets really hot, has the same view, only with a kindly old tree craning over and skimming the water to hide guests from the harshest moments in the sun. The sun-facing pool, on the northern tip of the islet, is a late-afternoon treat, and we watch the sun sink behind Krimovica, appearing to come to rest somewhere deep inside Boka Bay. Thankfully it’s not a long walk to dinner, which takes place at the Signature restaurant, a flight of stairs above us. Beneath a gentle canopy to guard against a rain which threatens but never comes, we enjoy fine dining and fine wine, while an enjoyably subtle guitar duo noodle away in a nearby corner. Montenegrin cuisine wasn’t something I felt I had a firm grip on before arriving, and I still don’t: the traditional dishes like the lamb cooked in milk required a day’s notice and unfortunately we couldn’t find the time during our stay. However the restaurant instead offers a very high-class mixture of Mediterranean fare, encompassing seafood chowders, sumptuous veal and truffled mac and cheese, all washed down with a smoky bottle of Vranac from Plantaže, Montenegro’s biggest winemaker. Thrilled by the quiet majesty of it all, we stumble back under the moonlight through what genuinely feels like our own private village, to our suite. The moon is high and the waves rustle insistently against the rocks somewhere below. We didn’t visit during peak season but the resort still had a decent number of guests; however the small room count and the idiosyncrasies of the old village mean that you just don’t run into lots of people. It really does feel like a luxurious, beautiful village, running invisibly to your benefit. Back at the room the complimentary minibar has been restocked after our enthusiastic arrival celebrations. The shutters have been closed to keep the bugs out. It’s now just a quiet haven for the lovebirds, flitting between the huge bathroom to the left (her), and the relaxing bedroom with the World Cup on the TV to the right (me), the two of us meeting in the lounge in the middle to withdraw from the minibar and trade stories of toiletries decanted into handmade rocky bottles, and spirit-crushing late winners for Uruguay. Perhaps this building used to be a farmer’s house, or the family seat of some fishermen; nowadays it’s just an immaculately appointed, rustic-feeling suite. One of only fifty. It shelters us from a monumental thunderstorm, which makes a serious impression on the foliage overhanging the pathways of Sveti Stefan. The next morning, the leaves are all but swept away by the time we emerge to head out across the isthmus (the internet reliably informs me that the proper name for this kind of path is an isthmus) to the newly refurbished spa. Its idyllic pool and treatment rooms back out onto a private beach and again, although staff inform us that the spa is fairly busy that day, it feels like the whole place is there for us. Staff are there when you need them and melt away when you feel like some privacy. The other key attribute off the islet itself is Villa Miločer, the former summer residence of the Queen Marija Karađorđević. 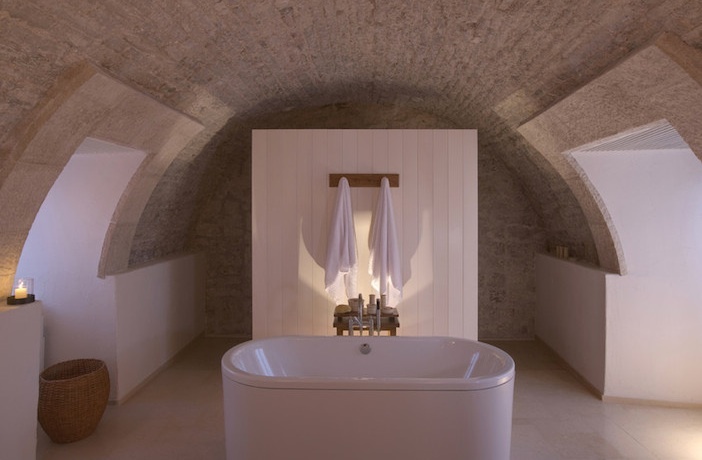 It’s now a part of the Aman Sveti Stefan resort, comprising eight suites upstairs, and the Dining Room downstairs, offering one table for each guest suite and pure devotion in terms of service. The fine dining is just as well delivered as Signature across the bay, but with a view across the gardens and private beach back to Sveti Stefan, perched nonchalantly atop the dark sea. A vision. After our superb meal at the Dining Room draws to a close we’re driven the five minutes back to Sveti Stefan – it feels decadent but the cliffside path might be a little treacherous in the rain and in the dark. As soon as we’re across that isthmus we’re enveloped back into the heart of our discrete little dream, a jewel perched on the Adriatic, admired from afar by so many but experienced and occupied by so few. I could use more words but the pictures say it all – look at that marvellous islet, those pools, those views. Imagine how wonderful it would be if it was as serene and beautiful as it looked. 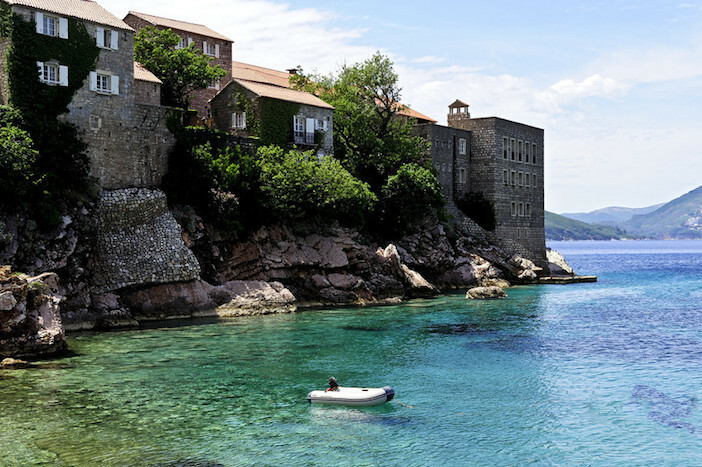 A stay at Aman Sveti Stefan in Montenegro costs from £750 (€950) per night, staying in a Village Room. The rate is subject to a 10 per cent service charge. The rate is room only and includes airport transfers from Tivat Airport. Additional charges apply for transfers from Dubrovnik and Podgorica. 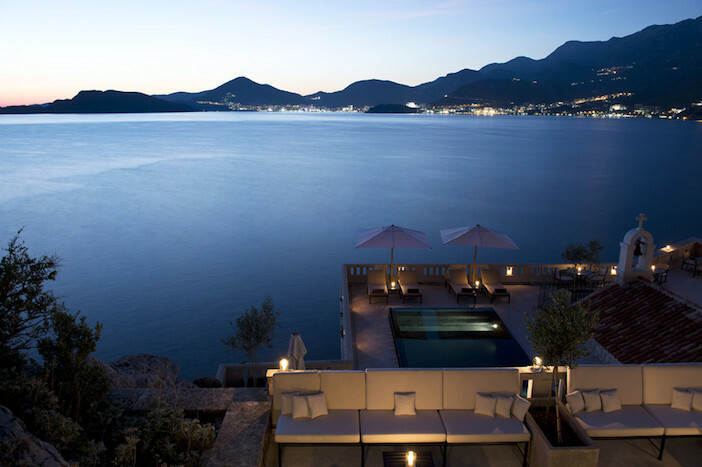 The season at Sveti Stefan starts from May 1st, Villa Miločer is open all year round. For more information and reservations visit the Aman Resorts website or call toll free on 00 800 2255 2626.